Thanks to NetGalley and Little, Brown for the ARC of this book. I read ‘The Dry’, Jane Harper’s first book in this series, earlier this year and really enjoyed it and found it an easy and engaging read, so I was excited to get the opportunity to read the next book in this series. I found it had the same good and bad points as ‘The Dry’. Plus points: I think the rural Australian setting is a really great backdrop for a crime novel; it’s a refreshing change from the standard crime tropes such as gritty urban underworld or 1920s manor house. The writing in both books is very fluid and easy to read, short chapters and well paced. The books are written without gimmicks, in third person past tense, which nowadays is actually also surprisingly refreshing. I don’t know why so many contemporary books stray from this formula, it makes for such a satisfying way to read. Negative points: both books suffer from same major flaw which is that there is one storyline/character which feels totally irrelevant to the rest of the story and therefore it’s obvious that that plot point/character must be central to the solution otherwise why would the author include it? This major flaw didn’t stop my enjoyment of the books but it does mean that you don’t feel quite so satisfied when your prediction proves to be correct, as it was so easy the reach that conclusion. I’ll definitely read any more books that appear in this series, they start with really interesting premises and are fun to read. 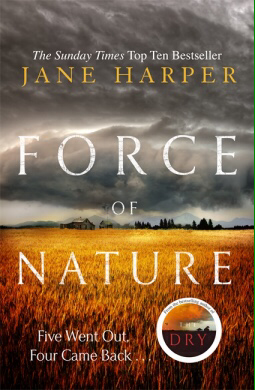 I liked the premise of ‘Force of Nature’ which is ‘5 went into the bush only 4 came out, what happened?’ as a starting point, just as I liked the ‘did this crime that clearly happened one way really happen that way’ premise from ‘The Dry’, but ‘Force of Nature’ never managed to be quite so intriguing as this premise promised. I’m not sure about the main detective character, Aaron Falk. His character didn’t feel entirely consistent with the previous book and his relationship with his new partner Carmen seems a bit forced. I think I would have been happier had there been a bit more crossover with characters from the first book to give his character’s personal life a bit more depth. Overall I think both books are great and I look forward to reading any future instalments.